The two most recent productions in Soulpepper’s 2013 season have been lively re-interpretations of texts that can only be described as classics. 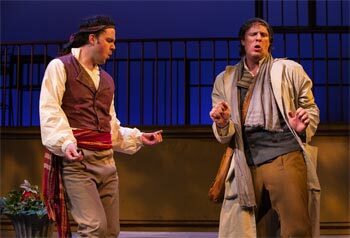 The first, Michael O’Brien and John Millard’s anachronistic take on Rossini’s The Barber of Seville, was a goofy romp-like good time and little more. The sublime pleasure of having the great Dan Chameroy back on stage in a musical leading role can’t be matched (nor can the giddy delight of Soulpepper heavyweight Gregory Prest prancing about first as a deluded fancyboy then, most gamely, in exuberant drag, rubbing his balloon breasts against Oliver Dennis’ unsuspecting face). Millard’s music is catchy and clever (though the modernism gets pushed one step too far when “Call Me Maybe” gets dragged into the affair) and O’Brien’s melancholically roaming Figaro gave Chameroy a showcase for his acting ability in addition to his well-documented comedic and vocals chops (both just so very wonderful). Courtney Ch’ng Lancaster, for her part, made a comedic mountain from the forgettable molehill that ingénue Rosina could have been. The utterly delightful actress is quickly distinguishing herself as the female standout of her Soulpepper Academy class and the company would be wise to keep her happily on their roster for as long as they can. The on-stage band (led by Millard and the trusty banjo Global Cabaret Festival patrons know so well) added to the ambiance of Ken MacKenzie’s breezy design while also adding the occasional deadpan wink of self-awareness when the piece played fast and loose with its own outlandishness. The Barber of Seville, though severely light on consequence and dramatic sophistication, was a happy diversion with a loveable cast clearly having a ball. It was an inventive representation of a famous piece in a new medium and it’d be hard to imagine anyone taking issue with something so innocently amusing. 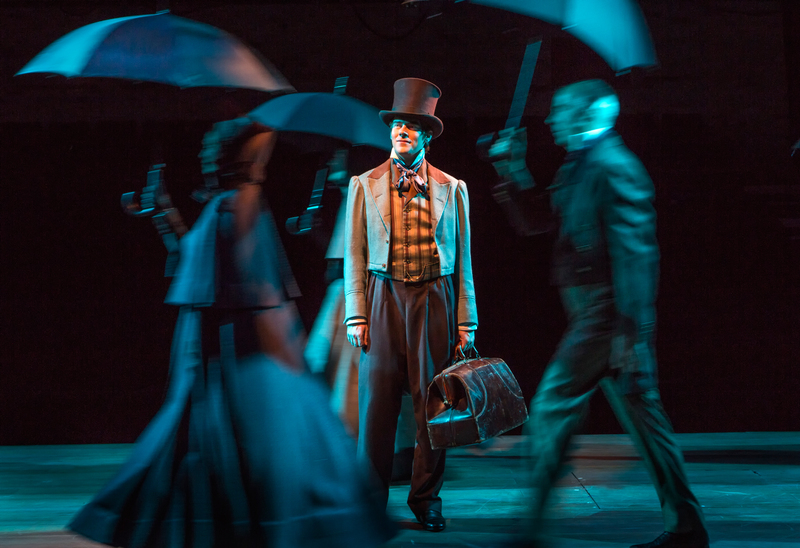 That spring production is followed this month by the first of four plays that mark the company’s ambitious summer season (counting the two parts of Angels in America separately): Great Expectations, a mammoth novel adapted for the stage, like Soulpepper’s trademark Christmas Carol before it, by Michael Shamata. After this second encounter with the marriage, I’m quite convinced that Shamata is the best thing to ever happen to Charles Dickens. Averse to broadly drawn cartoon characters of the Havisham variety and impatient with over-poetic, meandering prose, I (how shall I put this?) hate Dickens. He bores me to tears and frustrates me while he does it. A traumatic forced academic reading of Great Expectations is the clinching memory in this decisive hatred. I hate that Pip is so blinded by the idea of being a gentleman that he can’t see the true gentleman that Joe plainly is (this goes beyond youthful folly all the way to stupidity). I don’t understand how any young woman’s beauty can be compelling enough to make one put up with the outlandish cruelty of Estella. I don’t like the sense of uber-coincidence that overlays the story’s final act. But, mostly, I can’t wrap my head around how anyone, ever, no matter how mixed up their priorities, could want to spend any time at all in Miss Havisham’s dilapidated and maggot-infested house. Even the finest chandelier in the world doesn’t sparkle when covered in cobwebs. And if you can’t buy the allure of Miss Havisham’s upper crust world, the whole thing makes very little sense. Enter Michael Shamata, and Jeff Lillico. In adaptation, Great Expectations loses the dense wandering of Dickens’ narration and gives his potentially flat characters the great gift of some of Canada’s best embodiers, thus cutting through the book to tell the actual story and, most importantly, highlight the excellent themes that lie buried within. Shamata (doubling both as adaptor and director) uses the convertible Michael Young Theatre smartly with seamless transitions and simple staging. His double casting perfectly parallels characters and makes the large story tell-able with an intimate cast of eleven (particularly interesting is the appearance of Jesse Aaron Dwyre and Paolo Santalucia as minor female characters, played straight for only the laughs the characters earn for their own futility). The cast is universally splendid, from the stoically beautiful Leah Doz, who balances the charmingly bright Biddy with a miraculously humanizing turn as the bred-to-be-heartless Estella (the secret is in her yearning to feel), to Deobrah Drakeford as the hilariously dreadful Mrs. Joe. The aforementioned Dwyre is sadly underused as one of the few characters cut perhaps a bit too much from their novel incarnation- the tyrant Bentley Drummle- but up-and-coming Soulpepper favourite Santalucia scores with the only character I particularly loved even before Shamata took him up, the quirky and kind Herbert Pocket (a rare character who embodies both the varnish of a gentleman and the grain of one, to steal a metaphor from the novel). Kate Trotter is compelling enough as the detestable Miss Havisham though hers was an uphill battle she had little chance of winning with me (honestly, why is a story of this scope balanced so precariously on the shoulders of a character so outlandishly pathetic? Just stand up and move on, woman!). The emotional clincher that makes Shamata’s interpretation really work is the focus it gives to the truly beautiful character of Joe Gargery, the kind blacksmith who marries an unkind woman (“Mrs. Joe”) and acquires a pal and protégé in the form of her brother, the novel’s unfortunately upwardly mobile protagonist- Pip. Every wrong turn Pip takes (and he takes many) is driven home heartbreakingly when the audience is reminded of where that wrong turn has taken him in relation Joe, a man so good and deserving of good that he positively breaks your heart (the way Pip has to tell him not to wipe his hand before embracing him brought tears to my eyes). If the warmth and love of Joe is this strong in just any production of Shamata’s Great Expectations I couldn’t tell you because Soulpepper has the priceless advantage of Oliver Dennis, a venerable actor capable of playing an astonishing spectrum of parts but whose ability to imbue characters with uncanny warmth and love creates a wheelhouse where he can portray the most uniquely good humans with that special Oliver Dennis magic. Joe Gargery might just be the character most in Oliver Dennis’ wheelhouse that I’ve ever seen. He also plays the delightfully contradictory Mr. Wemmick with wit and generosity, but its’ Joe that makes Oliver Dennis inextricable from this production’s success. 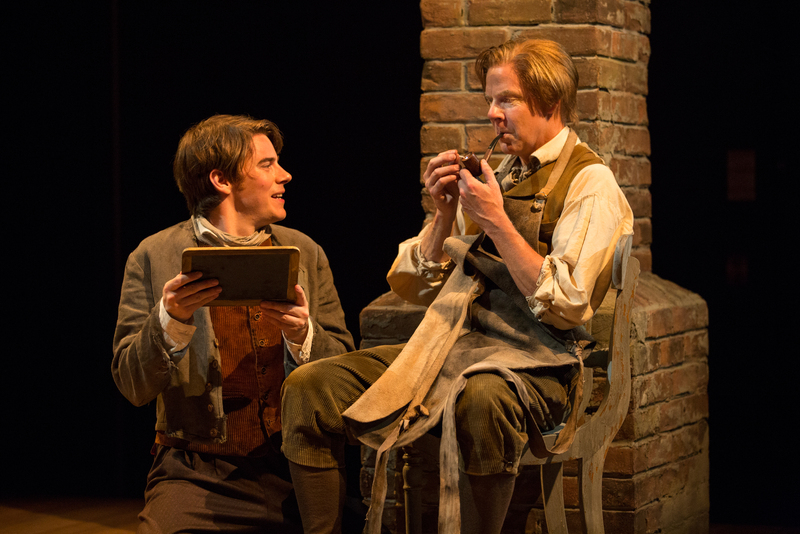 Having said all that about Dennis and the ensemble in general, Great Expectations belongs to Pip and this production lives squarely on the shoulders of the great Jeff Lillico. Playing the orphaned Phillip Pirrip from the age of 7 onwards for more than two decades, the ageless actor beautifully transitions his omnipresent character physically, vocally and emotionally, flipping on cue from the cockney accent that marks Pip’s youth with Joe to add a line of narration in the refined voice of the grown and darkened character in his thirties. Beginning with a remarkably convincing and crutch-free portrait of the timid, coarsely mannered, happy Pip in his youth, the subtle and faithful way Lillico grows Pip up before the audience’s eyes is astounding. We witness his damning turning points and his emotional breakthroughs, his greatest triumphs and his private heartbreaks, all building to the moment when the narrative meets with its narrator and the portrait of Pip that Lillico’s been building with Shamata on top of Dickens’ legend finally becomes clear. He’s an infuriating, endearing, immature, short-sighted, hopelessly human man whose expectations of greatness led him easily astray from goodness. I found it impossible to stay by Pip’s side through 544 pages with just Dickens to guide me but, in a world of Michael Shamata’s creation, I’d gladly follow Jeff Lillico through three hours of even the most misguided self-discovery.